Huntington Ingalls Industries' Newport News Shipbuilding (NNS) division hosted the Chief of Naval Operations for a tour of the shipyard. 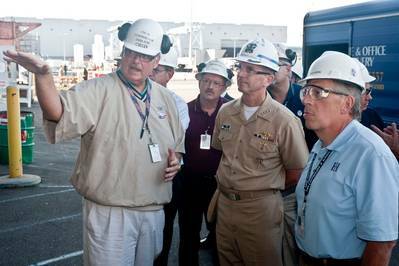 Chief of Naval Operations Adm. Jonathan W. Greenert was briefed on the shipyard's current work and capabilities and met with shipbuilders. The admiral also toured the aircraft carrier Gerald R. Ford (CVN 78) to see the progress being made on the first-of-class ship and the advancements in shipbuilding enabled by 3-D modeling and design/build strategies. NNS presented the design changes and industry-leading technologies on Ford, enabling significant total ownership cost savings over the ship's life. In the picture: CVN 78 Construction Director Tom Cullen (left) provides Chief of Naval Operations Adm. Jonathan W. Greenert with an update on construction of the island for the aircraft carrier Gerald R. Ford (CVN 78) while Newport News Shipbuilding (NNS) President Matt Mulherin (right) listens.